Instructor pilot Bob Hoelzen congratulates Sumner High School student Alexej Latimer for landing a Boeing 737 in a simulator during Alaska Airlines' annual Aviation Day. At Alaska Airlines' Flight Training Center near Seattle, DeMarco Best and his coworkers program, maintain and fix a row of highly-realistic flight simulators. 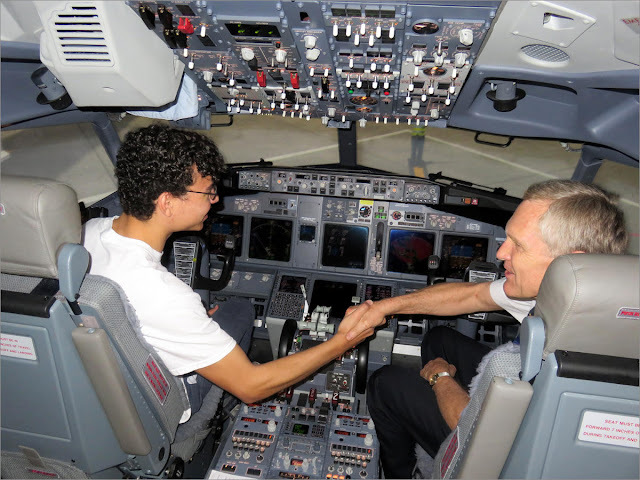 When Best sits at a Boeing 737 simulator control panel, he can trigger all sorts of complications for the instructor pilot and trainee in the cockpit. He considers himself "amazingly lucky" to have become a flight simulator engineer. "It's a job you will love,” he said. “I love my job. I love coming to work every day." Best's 35 year career in aviation is winding down. He started in the Air Force and has worked for the past 23 years at Alaska Airlines. "You've heard about the pilot retirement wave, but there is also a retirement wave in the flight simulator maintenance field,” Best said. “Even though our numbers aren't as large as the pilots, the impact might be greater than the pilots because we maintain these machines that the pilots actually train on day in and day out before they go out and fly you safely to your destination." Alaska Airlines and other carriers in the same position will need to find replacements with an unusual combo of highly sought after skills: computer science, electronics engineering, flying ability, and on-the-job experience. Best says there are only a few schools in the country that have a curriculum for flight simulator technicians. 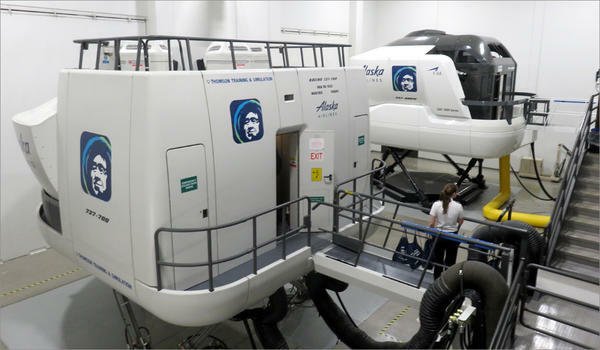 Alaska Airlines operates five Boeing 737 cockpit simulators at its Flight Training Center in SeaTac, Washington. "Pilots need to spend time in here,” he said. “As a matter of fact, when they come in once a year for recurrent training, if they don't pass that, they don't go back to the line and they actually don't have a job. That's how important these simulators are." There are other aviation careers where labor demand from the growing airline industry is zooming ahead of labor supply. The Boeing Company recently estimated North America alone will need 118,000 new commercial airplane mechanics over the next 20 years. Alaska Airlines chief talent scout Michaela Littman said the maintenance and engineering workforce is aging. "We're really encouraging and we are trying to partner with schools so we can build the maintenance and engineering pipelines to bring in some new workforce into the industry,” she said. In the technical and IT realms, Alaska competes for labor with tech titans such as Amazon, Google and Microsoft, which pay more. "But it's not all about the pay," Littman said. She said airlines have had to raise salaries to attract talent, but she mentioned advancement opportunities, the work culture and travel benefits as reasons to come on board. Last Saturday, Alaska Airlines, Boeing and other partners hosted 2,000 teenagers at SeaTac Airport to inspire interest in flight-related careers at the 10th annual Aviation Day. "Now is kind of the time to start and get them excited,” Littman said. 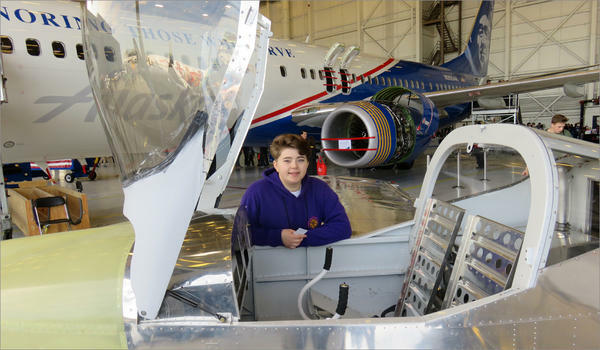 Sumner High School sophomore Alexej Latimer flew the jet simulator, toured a hangar and networked with industry insiders. "It's just incredible to see how much fun they all have,” he said in an interview. "I personally am more in tune with becoming a pilot. But that doesn't mean that working with mechanics on these same exact aircraft wouldn't be as exciting." Decatur High School junior Kendra Ulrich with a kit plane under construction by the TeenFlight Puyallup vocational nonprofit. Decatur High School junior Kendra Ulrich of Federal Way, Washington, joined an after-school club that's building single-engine kit airplanes. She said she's interested in an aviation job where she gets to talk to people a bunch. "So maybe not necessarily pilot,” Ulrich said. “But you know maybe I can get onto the (airport) police force that works here." One thing Ulrich's pretty sure of is that a job will be waiting when she finishes her education. "By the time that I get out of college, they could possibly be fairly desperate,” she said. "So I might choose one specific area and get there and they'd be like, 'Hallelujah, you're here. We'll take you.'" The Aviation Day event will be repeated in Portland on May 19.